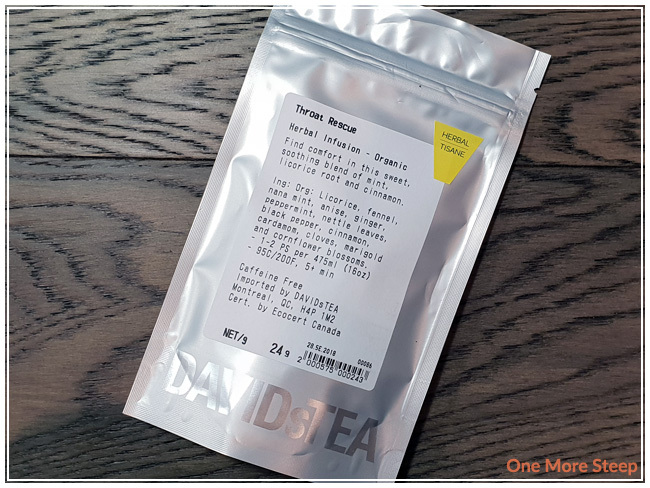 I first sniffed Organic Throat Rescue at one of my local DavidsTea retail locations, and I found it to be quite inviting. The aroma of Organic Throat Rescue is primarily that of ginger and mint. It does look quite beautiful, as a blend. I bought a small pouch to try it out before I opt for a larger tin (there are some cute ones this season…). 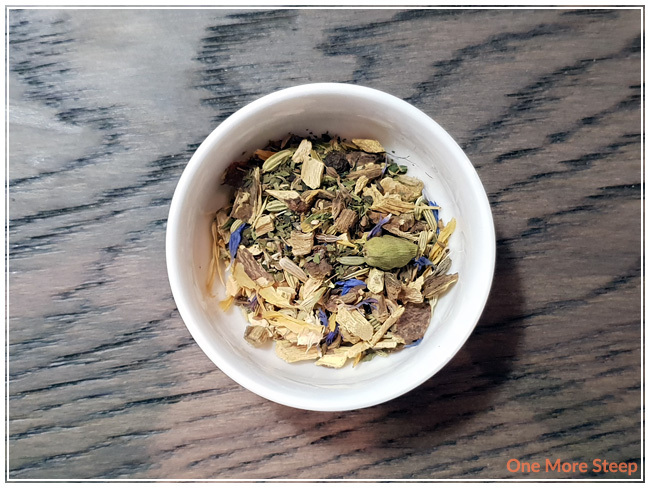 Organic Throat Rescue consists of (organic): licorice, fennel, nana mint, anise, ginger, peppermint, nettle leaves, black pepper, cardamom, cloves, marigold, and cornflower blossoms. I did have to look up nana mint because I wasn’t familiar with it, and from what I could understand, it appears to be a type of spearmint (or vice versa). DavidsTea recommends steeping Organic Throat Rescue in 95°C (200°F) water for 5+ minutes. I opted to do an initial steep of 7 minutes. Organic Throat Rescue steeps to a bit of a green-yellow colour. It still mostly has a ginger and minty aroma to it, but I think I can smell a bit of the cinnamon too. 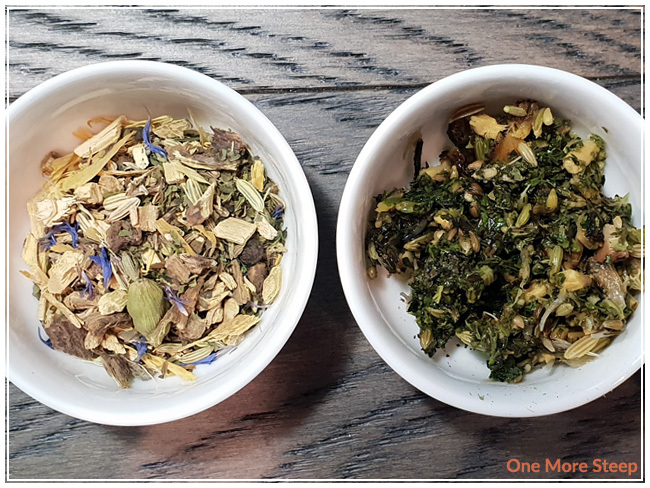 The herbal infusion has a really nice sweetness to it, the ginger and mint both provide warm and cooling notes to the tisane which is quite soothing (despite not having a sore throat). I think this would be nice when sick, and with spoonful of honey. 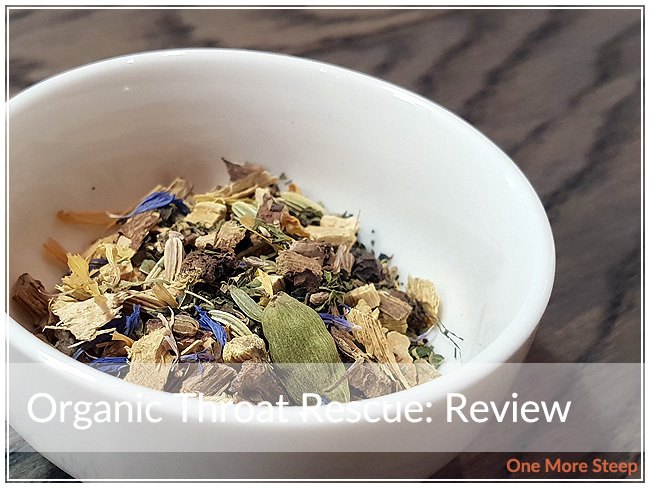 I attempted to resteep Organic Throat Rescue and found it didn’t have the same flavour balance. The ginger was slightly muted in comparison, and I got a lot of mint in the resteep. I didn’t really like it too much, and would recommend Throat Rescue for just one steep. I liked DavidsTea’s Organic Throat Rescue. 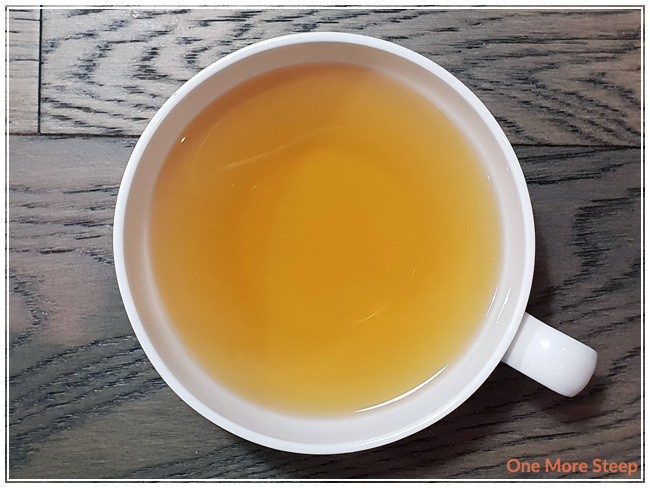 The flavour of ginger and mint are nice, and I’m not quite sure which ingredients lent itself to that sweetness – but it was an excellent touch. I can definitely see myself reaching for this when I’m feeling under the weather or on the verge of getting sick. That said, I would definitely add a dollop of honey because I like honey when I’m not feeling well.